Ranga reddy district Police Stations Phone Numbers in Telangana State: ranga reddy district has five revenue divisions of Chevella, Ibrahimpatnam, Rajendranagar, Kandukur, and Shadnagar. They are sub-divided into 27 mandals. The Revenue Division is further divided into Circle Offices which is headed by an Inspector. A Circle consists of police stations headed by an inspector or sub-inspector. The police department is committed a serving the needs of the citizens by providing them effective and efficient services. 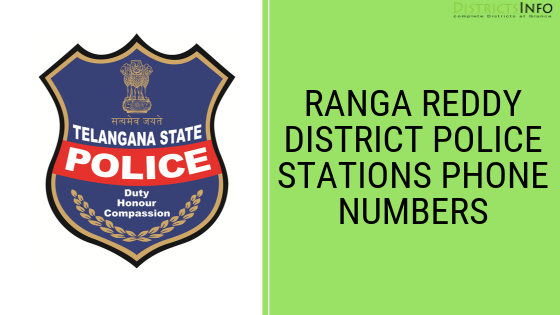 Here we are Listed below ranga reddy district Police Stations Numbers and cell phone numbers.